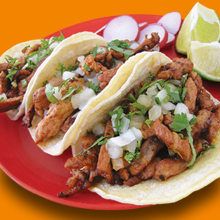 LA PALOMA TAQUERIA, We have multiple locations all with the authentic mexican flavor that you crave. Come visit us and enjoy the best authentic Mexican food and discover what everyone has been talking about. Visiting Dallas from Oklahoma City that would stop and have breakfast here, excellent breakfast burrito with potato, & Pastor tacos - awesome. Little mom-and-pop shop inexpensive great food give it a try. La Paloma Taqueria , invites you to live a unique experience full of home warm authentic flavors 100% Mexican. At La Paloma we use only fresh ingredients and the best quality to offer the best Mexican dishes. Do not miss out our famous Tacos al Pastor, Tortas, Sopes, Huaraches all prepared daily especially for you.